The New Forest Association is to give a rare honour to Ruth Chambers at the New Forest Show in recognition of her 10 years as Deputy Chief Executive at the Campaign for National Parks. The Association will make Ruth an honorary life member of the New Forest Association at a special ceremony on Tuesday 24th July 2012 at 11am at the New Forest Association stand in the New Forest Corner at the show. Belinda, Lady Montagu, Patron of the NFA, will present Ruth with a certificate to mark the occasion. Dionis MacNair, the longest serving NFA Council member, and Peter Roberts, NFA Chair, are also scheduled to take lunch with Her Majesty the Queen on Wednesday 25th July. Her Majesty is due to visit the show in her Diamond Jubilee year with Prince Philip and will have lunch with a group of invited local guests and VIPs. "Ruth contributed outstanding work for the Association during her time with the Campaign for National Parks and continues to be an enthusiastic champion of the country's open spaces for both recreation and wildlife," said Peter Roberts. "She is visiting the New Forest Show as a guest of the Association and we are delighted to honour her contribution in this way. She is persistent, knowledgeable, enthusiastic and determined and has achieved a great deal during her time in office. She has been a brilliant and passionate champion for national parks and for the natural environment." "We hope the Queen will have time to visit the NFA stand at the show and find out more about the important work we do," he said. The New Forest Show is from 24th to 26th July, at New Park showground, Brockenhurst. 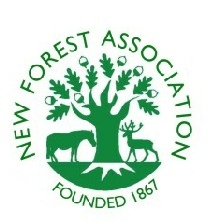 The New Forest Association, established in 1867, is one of the oldest conservation organisations in the world. It is an independent charity with over 900 members, and aims to protect the New Forest and to disseminate information about its culture, history and ecology. The Campaign for National Parks recognises the NFA as the New Forest National Park Society. New Forest Association Chairman Peter Roberts, responding to the publication of the Independent Forestry Panel final report today (July 4th), said the report does not go far enough. The NFA is disappointed that the report recommends planting more trees in the Forest and has not recommended that the New Forest be seen as a special case and as a 'Heritage Asset'. "This report marks a major step forward in the recognition of the importance of woodland to our nation," said Peter Roberts. "Their value as a source of timber, of opportunity for recreation and most importantly as a major part of the eco-system of our world is absolutely vital. They provide wildlife habitats and corridors. "However the New Forest Association is disappointed that the opportunity for improving the management of the New Forest appears to have been missed. We appreciate that there has been much hard work and thought gone into the overall benefits of Forests to the nation. Recognition of their value in terms of recreation capability and the eco-services they provide as well as timber is long overdue and very welcome. However the overall recommendation of planting more trees is just not appropriate for the New Forest as only a small percentage is actually covered by woodland." Mr Roberts said the NFA is not concerned with who manages the Forest, but with how it is managed. "Whilst the report is of a general nature to cover the whole of the Forestry Estate in England we think that the detail is important and that the New Forest as a unique 'Heritage Asset' deserves special attention and protection in its management policies," he said. "Under the Forestry Commission working to a national plan there has been insufficient evidence of that in the past. Many of the officers and field workers in the area have special knowledge and enthusiasm for doing the best they can but they have to adhere to guidelines which are inappropriate and in some cases can actually be damaging to the long term sustainability of the Forest. Mr Roberts said it was made clear to the group from the Independent Panel on Forestry, who visited the New Forest in February, that the area is not just about trees. Mr Roberts was included in the host group. "The word 'Forest' denotes its origins as land for hunting with heathland, mires and lawns as well as native trees. The point was made that it was out of the question to consider planting more trees but actually to speed up the process of removing inappropriate planting that took place on the heath land in the 1950s and 60s under a former misguided policy. These heathlands are now recognised as the largest area of lowland heaths in Europe, a very valuable habitat. is not enough. We already have a system in the New Forest where conservation is supposed to be a priority ahead of commercial timber growing and recreation but without sufficient resources it is meaningless and nothing will change. "The IPF visitors saw at first hand the use of the land for commoning as well as recreation and timber plantations and understood that the New Forest is unique and does not fit into any new 'one size fits all' ideas for increased planting that may be appropriate on a national basis. We shall therefore continue to press the Government to ensure that management of this unique area remains outside any new criteria for the Forest Estate as a whole and that adequate resources are made available to ensure that the Forest survives as a resource for future generations." The NFA, established in 1867, is one of the oldest conservation organisations in the world. It is an independent charity with over 900 members. Campaign for National Parks recognises NFA as the New Forest National Park society. The Independent Forestry Panel was established on 17 March 2011 by the Secretary of State, Caroline Spelman, to advise government on the future direction of forestry and woodland policy in England. People who care about the Forest and wish to find out more about the New Forest Association's work are invited to attend the NFA AGM and Members' Day on Saturday April 21st. The event, featuring a guest speaker and followed by a guided walk in the Forest, will take place from 10.30am to 1.30pm at Minstead Hall, Lyndhurst Road, Minstead, SO43 7FX. Speaker Dr John Godfrey will talk about a neighbouring national park in his presentation on The South Downs: Past, Present and Future. Ruth Chambers, former Head of Policy at the Campaign for National Parks, will also be made a life member of the NFA. Julian Johnson, Chairman of the New Forest National Park Authority and Alison Barnes, Chief Executive, will also attend. The guided walk, led by NFA Council member Richard Reeves, will consider multi land use issues in the Forest and will start at 13.30pm. The New Forest Association is to raise strong objections to the practice of adventure racing in the fragile habitat of the New Forest. Michael Chilcott, Honorary Secretary of the NFA, will serve a presentment to the Verderers' Court in Lyndhurst on Wednesday March 21st. The presentment registers the NFA's strong objection to adventure racing and calls for the Forestry Commission either to refuse permission for such events or to make sure they are adequately monitored. The NFA repeats its call for a review of cycling in the New Forest, made in a previous presentment in January. Adventure racing involves a combination of fast-paced, off-road running, navigating and mountain biking. The sport was featured in a BBC Countryfile programme about the New Forest on Sunday March 18th but the NFA says that the programme did not highlight the damage the sport can do to the New Forest's delicate ecosystems. The NFA also says that correct permission is not always obtained to stage such events. "We are not against cyclists - we regard the lawful use of cycling as beneficial to health and as a means to appreciate the wonderful wildlife and scenery of the New Forest," said NFA Chairman Peter Roberts. "But we ask cyclists and those supporting cycling in the New Forest to show consideration and respect for other users and to work to protect and enhance the area that is so valuable for their recreation. "The BBC Countryfile programme showed footage of damaging practices such as competitors racing over mires and heathland. The fragile landscape of the New Forest requires careful management and should be protected." The New Forest Association wishes to register, in the strongest possible terms, its objection to the practice of adventure racing using bikes as well as running on the fragile lands of the New Forest. The BBC's Countryfile programme on Sunday highlighted this damaging practice with footage of competitors racing over mires and heathland that should be protected by the Forestry Commission. We ask that the erroneous information supplied by the BBC should be corrected, and action taken against the business promoting this illegal use of the Forest. (1) A simple Internet search has shown that a similar event is due to take place this week-end. (2) We ask that the Forestry Commission withdraw permission for this or ensure that it is adequately monitored and does not damage the protected habitat of the New Forest. We remind the Court of our request made in January, now more urgent than ever, of a full review of cycling activity on the Crown Lands. The New Forest is suitable for many quiet recreational activities but is too delicate to be available for all activity. The Association regards the lawful use of cycling not only as beneficial to health but as a means to appreciate the wonderful wildlife and scenery that the New Forest offers. There are other forests with off-road tracks that are much better suited and appropriate for high speed mass cycling events. We ask that cyclists and those supporting cycling in the New Forest show consideration and respect for other users and work to protect and enhance the area that they value so much for their recreation. The New Forest Association supports responsible cycling both on and off road within the New Forest and recognises it will grow. But the situation is not satisfactory and getting worse and NFA echoes the concerns made by the Commoners Defence Association at the November Court. We have come across a cycle sport event taking place, in part on Forest gravel tracks in April, which the website promotes by suggesting that cyclists ‘will want to set a good time as they blast around this flowing course. '(1) Is this how we want the Forest used? Is it the form of recreation that should be endorsed by the Commission and Park Authority? The Verderers are to be congratulated for doing their own research into future recreational events and in their flexibility into avoiding a conflict in October by rearranging drift days. But is this their responsibly? Are these the right priorities? The New Forest is not getting any bigger, but year by year demand for recreation increases and will continue to increase. When will the Commission and National Park Authority accept this truth and start dealing will the increasing conflicts? New cycle routes have been suggested in the National Park Authority's Recreational Management Strategy. (2) NFA contends this is premature - it is time to take stock. What are we trying to achieve? What have been the successes of the existing off road routes? What have been the failures and how can these be addressed? Is the limited space in the Forest being used efficiently? Is this open access area being afforded sufficient protection? What is the best way for more and more visitors to enjoy the Forest without destroying the very thing they have come to enjoy? Do the Commission have both the resources and will to manage and police this increased recreation? How can the increasing conflict, the subject of numerous presentments in this Court be avoided? NFA urge the Verderers to seek from the Commission a review covering the management of recreation, the rationale of off road cycling, the success or otherwise of existing routes, an effective system of event management and policing, and suitable planning tools that will allow us to welcome ever more visitors with minimum damage to the environment and traditions of the precious and unique New Forest. Peter Roberts, New Forest Association Chairman, on 01725 514480 or email chairman@newforestassociation.org or Michael Chilcott, Honorary Secretary, on 023 8028 2532.